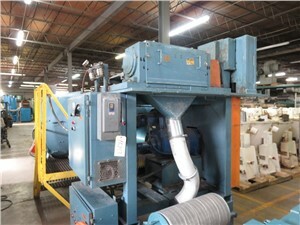 What is a Strand Pelletizer? Strand pelletizers are used to cut pellet for most thermoplastic materials to make a uniform pellet. Strand pelletizers (pelletiser) have many advantages compared to underwater/watering pelletizers including low cost, simplicity, and quick clean/set up times. The extruded strand and pellets can always be seen which give the operator more control of the process. The strand style pelletizer does have its disadvantages. Mainly, this style cannot create a spherical pellet which is required for some plastic processes. Also, space is an obvious drawback because of the long cooling troughs they require. Lastly loosening strands and the requirement of re-stranding the pelletizer can require more labor and attention during the extrusion process. The most important part of a strand pelletizer is the rotor. These rotors can be made in a variety of metal grades from standard tool steels to stellite and carbide tipped to handle the toughest of applications. The number of knives and the overall width of the rotor will directly affect the capacity and throughput that these machines can handle. The two main styles of rotors are solid milled helical rotor for a quieter operation, or bolt on rotor with replaceable blade rotor for more durability. The bolt on rotor has the ability to change and sharpen blades without replacing the rotor, which can be quite costly. Ease of access to the rotor and cutting chamber area is important, especially if you plan on many color or material changes. When buying a machine take notice how to properly gap the machinery’s cutting knives. There are several different styles that offer specific advantages. Some pelletizers also come with sound enclosures to help with sound. A stand pelletizing line can be used with a water bath or waterslide for cooling. Typically, an air knife is used to dry the strands before they are cut by the pelletizer, however there a few wet cut models available. Pelletizers are controlled with AC or DC Drives and use pull rolls to guide the strands into the cutter. Most machines have a single drive, however dual drive options are available to change the cut length by changing the speed of both motors.